Migrant Universe: The Evangelist is a brilliantly intricate composition that stuns in its elaborate detail and visual complexity. 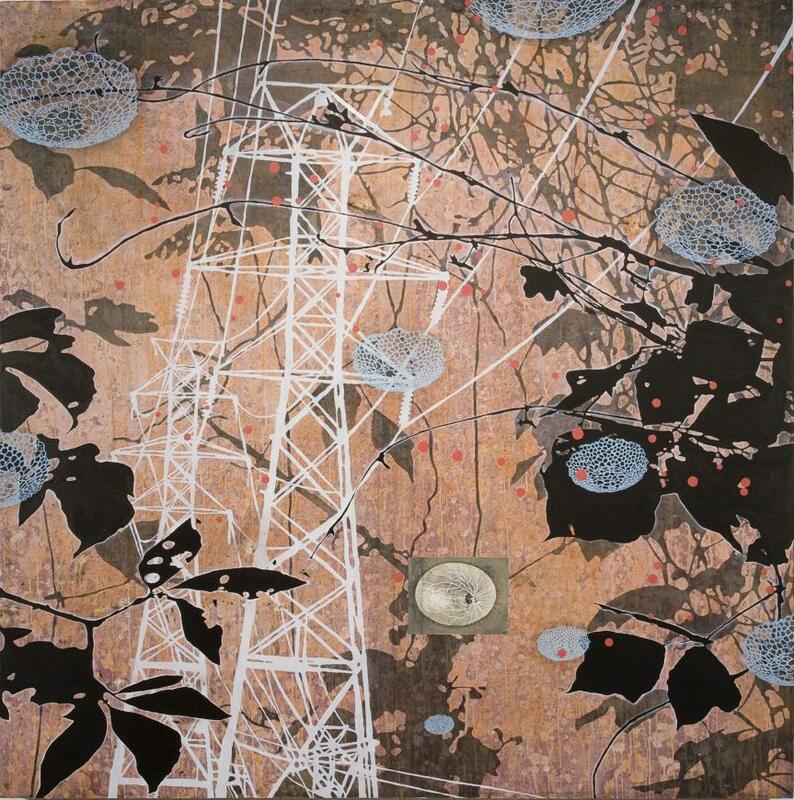 Drawing upon personal history and memory, Softić pulls her imagery from formative points in her own life: floating cellular forms in light blue reference the profound experience of using her father’s microscope as a child, while white outlines of transmission towers and power lines are reminiscences of sitting in the back seat of her parents’ car and watching the world outside go by. The Evangelist refers to an encounter the artist had in Mexico City with an evangelista, someone who transcribes the words of the illiterate in order to aid them in writing letters and composing documents. Softić has noted that she sees her role as not unlike that of an evangelista, distilling the experiences of the Migrant Universe into finite records on paper. Encircled by jet-black leaf forms and plant-like tendrils, The Evangelist juxtaposes the organic against the manmade. Central to Softić’s work are the themes of disparity and transience as they apply to identity; her forms are ephemeral and impermanent, but ever-connected by linkages and transitions that relate intimately to a worldview based on transformation through adaptation to difference. Created between 2007-2011, the Migrant Universe series is comprised of ten works that, taken together, constitute a ‘visual poem.’ Softić mounts fine Japanese paper onto a repeatedly gessoed and sanded birch plywood surface, then simultaneously sizes and stains the paper with thin washes of pigment and acrylic medium. She composes her imagery in acrylic, charcoal, chalk, and graphite, eschewing automatized techniques in favor of a highly manual and deliberate process.